Tell me if you relate – you have so much going on and yet underneath it all, you feel lonely. Like you’re going through the motions and for the most part things are fine, but inside it feels like no one truly gets you. So It became easier to isolate. But then food became my best friend. A recent study of 20,000 people revealed that one out of two Americans feels lonely. Lonely has literally become an epidemic. A deep sense of authentic connection and belonging. That they could be in a room full of people and feel totally alone. Or that they had a great life with so much to be grateful for, by that gnawing feeling of not belonging here never left. Or that, like me, food was their best friend. That’s why, in last weeks launch of Freedom Talks San Diego, the theme of our entire gathering was on The Alchemy of Belonging and the 3 elements you need in order to have a deep sense of belonging. I included some notes about some of what we discussed below. – What makes a group of people truly become a tribe is when you are united for a common reason or purpose that calls you forward into a more life affirming, generative space. * If you struggle in this area, you’ll often feel like a perpetual outsider – different – like you don’t belong. You may prefer being a lone wolf or prefer to be by yourself but you also may be avoiding intimacy, authentic connection and real love by doing this. It’s also common to not feel safe around others or fear getting hurt or rejected, and as a result, to hold back, avoid getting too close or act fake. This pattern creates a no win reality where to be around others feels totally unsafe and scary and to stay in isolation feels like you’re cut off and don’t belong anywhere except by yourself. **If you struggle in this area, you’ll often times feel like you’re alone and have to figure everything out on your own. You’ll typically feel like you need to rely on yourself because no one else is there for you at the end of the day. You may have some general spiritual beliefs but when it comes down to it, you are self-reliant, independent and less likely to ask for help. This can have you feel utterly alone and misunderstood but it can often just force you further into yourself to ty and get things together. This pattern is a recipe for perpetually feeling alone or like you’re on your own. – Feels safe inside – like you can take a breath, relax and be present. – Has you out of your head and connected in your body. – Allows you to keep centered and grounded and not get thrown off or caught up in others drama, opinions or actions. ***If you struggle in this area, you’ll typically feel like you’re always up in your head – obsessing about something or trying to figure out what to do. It can have you feeling anxious, overwhelmed or full of doubt. You may get neck and shoulder tension or have chronic pain. You may obsess about or judge your body, but you are rarely in it. This can have you feeling perpetually alone because not being in your body means not being connected to your core truth or your body’s wisdom. Living outside your core truth and body’s wisdom will keep you feeling like an outsider – not just with others, but also from yourself. Out of these 3 Elements of Belonging, which do you feel you’re strongest in and which is your biggest area of growth? Hit reply and let me know – I’d love to hear from you. 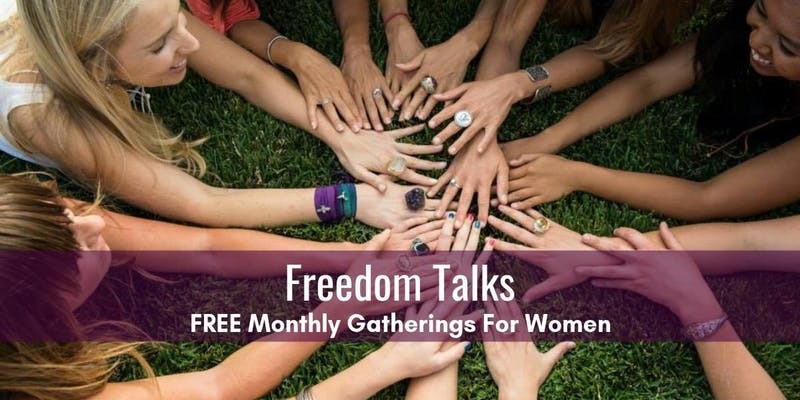 Do you want more authentic connection with other women as you deepen in your own spirituality and freedom? Then come and join for FREE! Click Here.